As I sit here staring at my box of 10 Chilean Sauvignon Blancs that I received for the next Wines of Chile Blogger tasting it got me thinking about a conversation last week at DLW10. I was having lunch with the VA wine mafia and honorary member Lenn, and we were talking about receiving samples. I think Lenn asked about Virginia wine samples and to his surprise I think we all said that we’ve never gotten a wine sample from Virginia. That’s not to say I haven’t gotten a comp bottle here and there, but not to the extent that I receive samples and press kits for wines from other states and countries. When I sit back and think about it, I do feel it’s weird that wineries in the state that I live in and write about the most don’t reach out to myself or the multitude of bloggers here in the Commonwealth. Not sure why this is the case. Is it lack of production levels so they can’t afford a sample program? Lack of knowledge about social media, and the impact of blogging? I’m not sure about the answer and I guess I’m looking for a response from wineries here. Please don’t take this post as a request for wines! I get plenty through my day job and am not requesting an onslaught of VA wines at my door. It is more of an observation. Why you should buy wine from independent wine retailers. Of course I am bias, and there are many reasons you should buy from independent wine merchants (service, selection, they know you by name, etc.) but this one is more to the quality of wine you are getting. 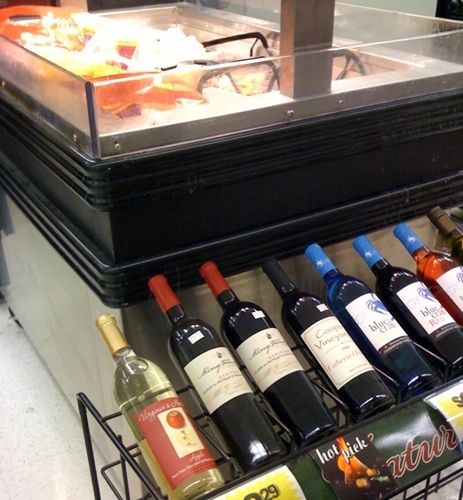 In the picture below you can see how a certain grocery store care for their wine. There it is, the Virginia Governors Cup winning wine leaning up against the rotisserie chicken station. Constant contact with a 125+ degree unit equals not good for wine! (the sign is correct, this IS A HOT PICK) Being next to that much heat for extended periods of time, will ruin the wine, by among other things, drying out the cork and letting air in, as well as literally cooking the wine. Most independent wine shops are temperature controlled, as well as have the bottles lying on their sides and to my knowledge will never rest the wine against a chicken hot box. “They” care about the product they are selling you and want you to have the best experience possible when you enjoy your vino with family and friends. A sign of consumers drinking local? I came across the article “Off-Premise Wine Sales Slightly Decrease in November versus Same Period Last Year” on WineBusiness.com a couple of days ago, mainly just doing some research for my retail wine gig. Within the article it was pointed out that although sales dropped overall, domestic wine sales rose while imports fell. I didn’t think much of it at first – thinking that price could be a factor during these economic times. Imports can tend to be higher priced (there are exceptions) and people are less likely to explore unfamiliar regions/wines/countries when they are strapped for cash. Thinking back on the article today I thought maybe there was another underlying message here, are people starting to buy more local wines? Unfortunately I don’t think so. If you look at the next graph from the article you will notice that most of the rise in domestic sales is driven by wines in the price range of $3 – $5.99 and $9 – $14.99. Unfortunately most local wines, at least here in Virginia, are not in this price range specifically not the $3 – $6 category which saw the largest growth for the year at 9.0%. I have a feeling it is being driven by brands like 2 Buck Chuck, local if you live in California I guess. Not sure if my interpretation is correct – just my two cents. “This past Friday a circuit court judge of the Twentieth Judicial Circuit issued an order that could impact the Virginia wine industry far beyond the borders of Fauquier County, the locality in which Kate Marterella operates her family’s farm winery. Although the case centers on the interpretation of the Declaration of Covenants governing the Marterella’s subdivision, the judge held in the order that the on-site retail sale of wine is not an agricultural activity. In defense of this position, the Court references Webster’s New World Dictionary, 3rd Ed. for the respective definitions of “agriculture” and “retail.” Specifically, the Court holds that “agriculture does not include the on-site retail sale of wine by the glass.” The Court analogizes that “a farmer who sells the cattle he raises on his property is engaged in agriculture, but he could not sell butchered and packaged meats to consumers on his property and still call it agriculture.” We at the VWC believe the beef cattle farmer would disagree and we know our winegrowers do too. In its order, the Court makes no reference to the July 1, 2009, amendment to Virginia Code Section 15.2-2288.3 that declares “the agricultural nature of … activities and events” relating to the marketing and sale of wine at Virginia farm wineries.This past session of the General Assembly, the Virginia Wine Council fought hard to have that designation made part of Virginia law and it is regrettable that the Circuit Court did not take notice of it. In case you hadn’t noticed, Anything Wine was in Long Island this past weekend for the first of hopefully many “Taste Camp East”s (2010 is tentatively planned for the Finger Lakes and 2011 in Virginia). The first annual event was dedicated to Long Island wine country and was spearheaded by New York wine guy Lenn Thompson of LennDevours. In addition to reconnecting with all of my blogger buddies and meeting some new ones, I discovered a “new” wine region, which made some great and surprising first impressions on me. Megan and I had no idea what to expect as we made our way up the North Fork of Long Island to our hotel in Greenport. We were delightfully surprised by the cuteness of the landscape as we were suddenly surrounded by vineyards and farms. The flat, vine-dotted landscape reminded me of the Niagara Peninsula wine region which I visited a few years back. Over the next few days I’ll be putting up some posts with individual tasting notes and some videos and pictures from the weekend’s tastings, but this post is intended to summarize my overall impressions of the region. Camaraderie – Several times as we drove from winery to winery, Megan and I reflected on the obvious camaraderie that we felt and saw between the vintners in the region. Perhaps because of the small size of the region, the relative youth of the wine industry there, and the unique challenges that wineries face in the region, the vintners really seemed to learn from each other and to leverage others’ knowledge and experiences, successes and failures. I think this is a must in a burgeoning wine region and is something I have seen in my explorations here in Virginia as well. Price – I am sure I will not be the only Taste Camper to mention price after this weekend’s festivities, so I will be brief. As here in Virginia, price is always a point of discussion when it comes to the QPR of LI wines, and this is something I have discussed with Lenn several times. Although I was impressed by the quality of the many of the wines I tasted, it was hard for me to warrant the many $40+ price tags that these wines garnished. That being said, I did buy several bottles, two of which were $50 and $100, and we did taste several fabulous wines that were under the $20 price point. Long Island vs. Virginia – I am a big proponent of Virginia wines and have some favorites from the region that I think deserve accolades against some of the top wineries in the country. With that being said, I think the overall quality of what we tasted in LI was slightly higher, on average, than what I taste in Virginia. Obviously that average is slightly skewed because Lenn, I’m sure, had us taste the best of what the region had to offer. An interesting observation was that when I didn’t like a wine that I tasted this weekend, it had similar aromatic and taste faults to those that I sometimes find in Virginia wines. Specifically slightly oxidized notes, chemical/metallic aftertaste and the over use of oak, the last of which isn’t held by Virginia alone. Passion – WOW! The LI winemakers’ extreme passion and enthusiasm for viticulture and enology was truly palpable. 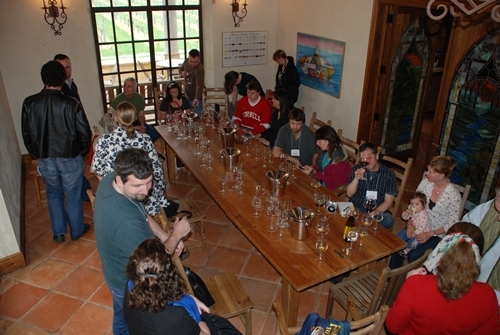 It was really exhilarating, and added an invaluable component to my tasting experience. Thanks again to all the Long Island Wineries that made us feel at home, poured hundreds of wines for us, and opened my eyes to what this region has to offer. Check back soon to see all of my tasting notes and more pictures and videos from the weekend. Governor Kaine has signed into law several pieces of wine related legislation, bringing to a close a successful General Assembly Session for the Virginia Wine Council and for the entire industry. On July 1, 2009, HB2071 and SB1033 will become the law of Virginia. Those two identical bills confirm the agricultural nature of Virginia farm wineries’ marketing and retail activities by amending § 15.2-2288.3 of the Code of Virginia. The Governor has also signed SB1445, which permits wine-of-the-month club operators to solicit memberships at any location for which an ABC license for on-premises consumption has been issued. Please take this opportunity to thank your legislators for their continued support. Is Dom Perignon Rose the next Cristal? What started this thought of Dom P Rose taking over for Cristal in the rap world was when a gentlemen came in the shop the other day to ask for a bottle of ’96 Dom Rose. He was actually quite young so if we had it I would have had to card him, but at the time I thought it was strange request. After a little discussion with one of my wine friends and some lyric Googling on the internet, it turns out the bubbly has been mentioned for quite some time, but not yet to the level of the infamous Cristal. As far back as 2006 when Jay-Z declared that he will no longer be drinking Cristal, in which the same press statement said he will now be filling his flute with Dom P Rose it has been mentioned here and there. 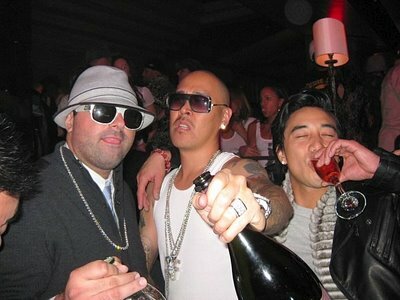 In the past few years a splattering of rap/hip-hop songs have donned Dom P Rose in their lyrics. Not the usual topic I write about, but thought it would be an interesting idea to float and see if Dom P Rose will explode in the main stream like Cristal did. Now that the General Assembly has adjourned sine die (without a fixed date to return), the Virginia Wine Council is grateful for an extremely successful legislative year. HB2071 (Scott) and SB1033 (Hanger), our bills that address the agricultural nature of farm wineries’ activities, have each passed the House and Senate, unanimously. They will now be sent to the Governor for his review. SB1445 (Deeds), relating to wine-of-the-month clubs, passed the House on a vote of 93 to 4 and will also be sent to the Governor. HB2523 (Wright), the legislation relating to ABC licenses that was successfully amended at the VWC’s request, has been approved by both the House and the Senate. Because the Senate had further amended the bill, the amendments had to be voted on by the House a second time. HB2523 now enumerates certain crimes that a licensee must make a reasonable effort to prevent on the premises, including manslaughter, terrorism, abduction, driving under the influence, and disorderly conduct. The amendments to HB2523 were unanimously approved by the House and the bill will also be sent to the Governor for his consideration. Our success during this legislative Session is directly attributable to the good will the industry has built up over many years with the legislature, the Governor, and his administration. We also benefited from strong relationships with the Virginia Agribusiness Council and Virginia Farm Bureau, who share our enthusiasm for a strong and growing wine industry in the Commonwealth. I strongly encourage you to become involved with both organizations over the next year. During the coming months, I hope to visit as many farm wineries and vineyards as possible to better understand the needs of the industry and to gather ideas for next year. In the interim, I hope that you will reach out to your local senator and delegate to better inform them, as well. If you are uncertain who your legislators are, please use this website to find out. “This week promises to be very hectic, with a great many bills moving toward ultimate passage or meeting defeat in committee or on the floor. I am happy to report, however, that as of TODAY HB2071 has been passed by the Senate! Our companion legislation that also deals with the agricultural nature of farm wineries’ activities, SB1033, is still before the House of Delegates, but is on the calendar as an uncontested bill on third reading. SB1445, relating to wine-of-the-month clubs, has been reported out of the House General Laws committee on a vote of 19 to 2, with Delegates Carrico and Hull being the only dissenters. As of today, it was on its second reading on the House floor and will likely be voted on later in the week when the House takes it up with other Senate bills on third reading. “Last week we reported that Delegate Tommy Wright (R-Lunenburg) had sponsored legislation that would permit the Virginia Department of Alcoholic Beverage Control to revoke the licenses of any establishment, including farm wineries, for certain enumerated activities. Under the introduced form of the bill, a license could have been suspended or revoked if a licensee operated the licensed premises (e.g., a farm winery) in such a manner so as to adversely affect real property values within the adjacent area. A license could also have been revoked if a licensee substantially interfered with the usual quietude and tranquility of an adjacent residence or residential area. “Senator Creigh Deeds (D-Bath) sponsored legislation on behalf of his constituent, Willis Logan, to clarify that he may continue his present business model of soliciting wine club memberships at wine festivals and events. In recent months, ABC had ruled that such solicitation constituted a sale of alcohol and was therefore not permitted under present law. The bill, known as SB1445 , will permit “wine of the month club” operators to solicit memberships at any location for which a permit to consume alcohol has been issued, including restaurants. If you would like to get updates from the Virginia Wine Council click here to subscribe to their newsletter. It’s OK Mommies to be, drink up, well only a little! With Megan and I being surrounded by friends that are having babies, we have been talking more and more about the subject. Along with the usual baby talk comes the talk around the fact that she would have to stop enjoying wine for the 9 months of pregnancy. Megan has insisted that it be only fair that I stop drinking wine as well for those 9 months! Not being too keen on that idea because so much of my life revolves around the wonderful world of wine, I am somewhat excited I came across this new study, well sort of. A study in the October issue of the Journal of Epidemiology published a study saying that it may be okay for pregnant women to drink one to two glasses of wine per week. 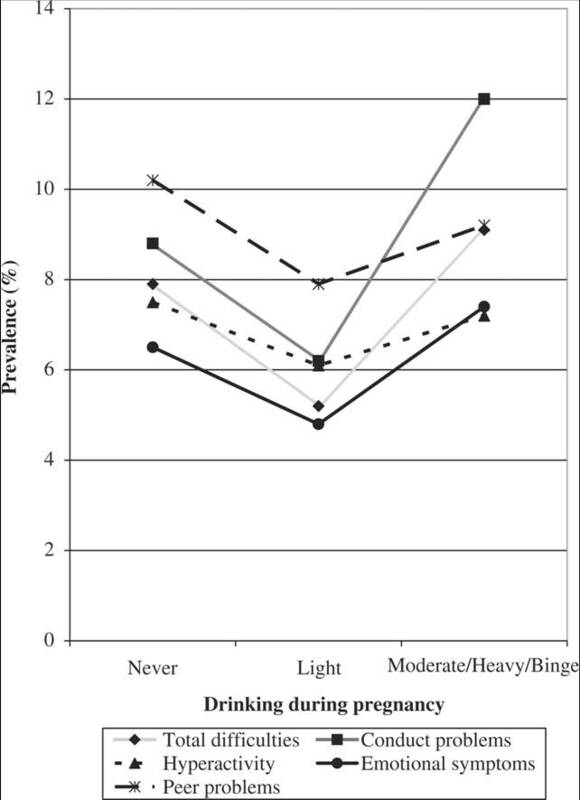 The study showed that women who drank “not more than 1–2 drinks per week or per occasion during pregnancy were not at increased risk of clinically relevant behavioral problems or cognitive deficits compared with children whose mothers did not drink.” In addition, the study showed that children, especially boys, born to women who were light drinkers performed better cognitively compared to children born to women who did not drink at all. There is a great article on the Virginia Business Magazine’s website today detailing the growing presence on Virginia Wine on the national scale. What a great way to kick off the 20th Anniversary of VA Wine Month! Here are a few of the highlights – (my comments to each are in blue) Click the article link above to read it in its entirety. “At restaurant Tru in Chicago husband and wife chefs Rick Tramonto and Gale Gand preside over one of the nation’s most innovative kitchens. The wine list alone tempts patrons with 1,700 labels from venerable producers throughout the world. So why would Chad Ellegood, the restaurant’s wine director, be striding through the dining room clutching a bottle of Barboursville Vineyards 2006 Reserve Viognier from upstart Virginia? This is great to see Virginia wines being offered on restaurant wine lists outside of the state, especially at James Beard Award winning restaurant in a dining mecca like Chicago. Barboursville is quite large on the VA wine scale as far as case production goes so I hope to see some of the smaller wineries reaching out across state lines in the future. I realize that this is not in the best interest for in the short term though as it reduces profit margins for the smaller wineries, but in the long term, it will bring more business and recognition to the state. The price-point is where I feel a lot of Virginia wineries get hurt. Production costs are higher due to the small production of most of the wineries and without established reputation it hard to stomach the usually doubled or tripled price points of similar quality wines from around the world. This is not to say that a good percentage of wineries are charging what I feel is proper pricing for their wines, but a lot of wineries get away with over pricing their product to customers willing to pay for locally produced goods. In the short 5 years that I have been drinking Virginia, I have seen a dramatic improvement in the quality across the board. So I can only imagine, what kind of changes people are realizing that have been following the Virginia wine industry for 15-20 years.